The Crows are flying on the track in their earliest return to pre-season training since 2014, kicking off in Mount Barker with the first-to-fourth-year players on November 5. Coach Don Pyke was overseas for the first couple of weeks, but has since been heavily involved in training sessions. Physio Steve Saunders has been an important off-field addition with his knowledge and experience. Brad Crouch: The good news story of the pre-season. The unlucky midfielder is making positive progress from groin surgery in June. He's been running strongly and getting through most of the training. On track to play in the JLT Community Series. Tom Doedee: The emerging defender has fully recovered from surgery on a fractured collarbone at the end of the season. Has had his training workloads monitored after his first full AFL season. Jordan Gallucci: A toe injury suffered midway through November is a minor setback for the third-year forward/midfielder. Will return to full training shortly and looks to have put on some size during the off-season. Hugh Greenwood: After playing every game last season, the 26-year-old midfielder has been eased back into pre-season training. The former basketballer was on a similar program last year. Kyle Hartigan: The key defender has been limited with what he's been able to do after having surgery on both knees at the end of the season. Hartigan is expected to resume full training in the new year. David Mackay: The veteran midfielder/winger had Achilles surgery in mid-November and is expected to resume full training in the new year. Shane McAdam: After joining the Crows in the Trade Period as part of the Mitch McGovern deal, the former Sturt forward has been on a modified training program. He's been working on agility running drills at training. Andrew McPherson: The second-year defender has been on a modified training program after only playing three SANFL games this year because of groin and hamstring injuries. Has increased his running loads gradually. Andy Otten: The experienced defender is back to full training after having Achilles surgery at the end of the season. The 29-year-old is entering his 12th pre-season, so it's no shock if he is eased through the odd session. Brodie Smith: The dynamic half-back flanker is in great nick and back to full training, having played in rounds 20-21 in his return from a torn ACL. Smith credited physio Steve Saunders for teaching him hip-strengthening exercises for the ongoing management of his knee. Kieran Strachan: The developing ruckman – taken with the No.7 pick in last month's rookie draft – is on a modified program after surgery for a fractured shin in July. The 23-year-old has returned to running and should be back to full training early in the new year. Taylor Walker: The Crows skipper is back to full speed after having surgery on the plantar fascia in his left foot in August. Looks in good nick after an injury-interrupted season in 2018. Aside from the draftees, most of the squad has already got through a mountain of work. With such a young list, running programs have been kept similar to last pre-season to monitor improvement and minimise the risk of injury. Still a nomadic pre-season team, the Lions have not only trained at Yeronga but also headed to the northside suburb of Brendale (where the AFLW team generally plays). Federal funding for the club's proposed training base at Springfield can't come quick enough. Connor Ballenden: The hulking forward is slowly recovering from a broken wrist and still sports a protective guard at training. He's doing modified footy drills and contact work. The loose timeframe for a full return is early in the new year. Tom Berry: Drafted with a not-so-serious knee problem, Berry is just beginning a modified running program. He'll be integrated into team drills after Christmas and isn't a major concern. Charlie Cameron: Has cut a lonely figure running lap after lap after lap at he recovers from the Lisfranc injury that cost him the second half of 2018. Cameron is moving well at speed now and has started taking part in small team drills. Should be unleashed at full capacity shortly after the players return from their break. Darcy Gardiner: His reconstructed right shoulder is progressing well. The rugged defender has completed all the running, taken part in most team drills but will be held back from contact until the new year. Connor McFadyen: Has almost overcome the broken foot that wiped out the end of his under-18 year. McFadyen has been restricted to upper body circuits at training but will commence running within a week and slowly progress to team drills by February. Tom Joyce: Has been put on a modified program to start his Lions career after hip surgery earlier in the year. Has been running strongly in his first fortnight though and will take part in team drills after Christmas. The balls were out from day one of pre-season training, with a couple of fresh faces leading the way. New co-captain Sam Docherty has been a vocal presence with the group as he returns from a knee injury, while new high performance manager Andrew Russell has also been a visible figure. He's leading every running drill and is doing specialist programs with a select group of players. The Blues have a relatively clean bill of health going into 2019. Matthew Kreuzer: Fully recovered from his heart issues, having had his 2018 season ended early. He's now back in full training and is completing every session with the main group. Alex Fasolo: Carried a slight ankle injury with him to Carlton. He was restricted to running laps to start pre-season, but is back training with the main group. Will Setterfield: The new recruit is still recovering from an ACL injury, sustained during last season's JLT Community Series. He remains in the rehab group, though the Blues expect him to resume full training shortly after Christmas. Matt Owies: Carlton's Category B rookie had a slight hamstring injury when he arrived at the club during the NAB AFL Trade Period. He's since fully recovered, having been with the rehab group, and is completing main sessions. Finbar O'Dwyer: A late pick in the NAB AFL Draft, O'Dwyer missed the majority of last season with a series of injury issues. His management loads are being monitored closely up until Christmas, while he's expected to join the main group early in 2019. Liam Stocker: Finished his TAC Cup season with a minor shoulder injury, but has since fully recovered. He joined Carlton's main group from day one of pre-season. The senior squad returned for pre-season training at the start of this week following the Grand Final loss. Tom Phillips won the club's time trial for the fourth year in a row after a career-best year at AFL level. Without coach Nathan Buckley there full-time, assistant coaches Justin Longmuir, Robert Harvey and Brenton Sanderson have assumed more responsibility in the design and implementation of drills. Fitness boss Kevin White has had an emphasis on interval and repeat speed running training, with second-year youngster Jaidyn Stephenson, sporting some new ink on his calf, the standout in these sessions. Tim Broomhead: Continues to run laps at training after the horrific broken leg he suffered in March last season. The midfielder will soon step up his training after being moved to the rookie list in the off-season. Lynden Dunn: The veteran defender is targeting a return to the field in March or April, with all going well in his recovery from a knee reconstruction. Matt Scharenberg: Scharenberg is at the five-month stage of his recovery from the third ACL tear of his career. The defender is out on the track running laps. Jeremy Howe: Howe is able to run, but not join in any contact work until late January following a shoulder operation at the end of the season. Jamie Elliott: The high-flying forward is back training strongly after a visit to Germany to consult with hamstring specialist Hans-Wilhelm Müller-Wohlfahrt. Darcy Moore: Like Elliott, Moore also visited Germany recently to get to the bottom of his hamstring issues. The key defender is back in full training and looking fit. Will Kelly: The father-son draftee is building into his pre-season training program after having ankle surgery before November's draft. Kelly is expected to join full training soon. Daniel Wells: The veteran midfielder is still on a modified program after the foot issue that hampered his 2018 season. After the injuries he has faced in recent seasons, the Pies will be cautious with his comeback. The Bombers have spent their first three weeks back at the club but will next week head off-site, going to Barwon Heads on Victoria's surf coast for a couple of days of meetings and a session at Ocean Grove Oval. With the addition of Ben Rutten as an assistant coach whose brief is to oversee the Bombers' team defence and key position players, it is clear Essendon will be working on that area over summer in a bid to tighten up and match it with the best teams. Josh Begley: Begley has reached the seven-month mark of his rehabilitation from a knee reconstruction. The aim is for the powerful medium forward to transition into the main training group after the club's Christmas break. Tom Bellchambers: The ruckman was one of only a handful of players to undergo surgery, with the big man requiring a shoulder operation. He is expected to rejoin full contact drills after the break in January. Joe Daniher: Daniher has looked a little proppy at training since the club resumed its pre-season campaign, with the key forward still recovering from the osteitis pubis that ruined his 2018 campaign. The Bombers hope he will be back training with the main group in January. Orazio Fantasia: A training accident saw Fantasia hurt his little finger, keeping him away from drills for the next few weeks. He is still able to complete all the running sessions and will wear his finger splint in the lead-up to Christmas. Martin Gleeson: The Bombers missed Gleeson all of last year after he underwent ankle surgery after a mishap in the JLT Community Series. They hoped he would miss only three months originally, but is still some weeks away from participating in full training. Dyson Heppell: Essendon has given its skipper a lighter start to the summer program after he was sore at stages throughout last season. He has mainly been training on the Bombers' smaller oval at its Tullamarine headquarters getting his work in. Luke Lavender: The young developing key-position player had shoulder surgery in the off-season but is progressing well and is also likely for full contact training in January. Mason Redman: Redman will need a follow-up scan on his fractured ankle in coming days after youngster suffered the setback last week at training. The club was waiting for the swelling to dissipate before assessing how many months he will be out of action but it will severely impact his pre-season. Devon Smith: The Bombers have given Smith some time on the sidelines at the start of this pre-season after a taxing year in 2018 that saw him play every game. He had endured a tough run of knee injuries prior to this year. Several senior players, including the Hill brothers and Joel Hamling, returned to training early but Stephen Hill underwent quad surgery this week and there are serious doubts over his round one availability. Freo has had an emphasis on defending ball movement in match simulation and will dive deep into Ross Lyon's gameplan during next week's Gold Coast training camp. Harley Bennell: Is walking the career tightrope after two games in three seasons due to calf setbacks but returned in excellent shape and has completed a power of running when not involved in full training. Connor Blakely: Ran well in the first time trial after season-ending knee surgery and has been in the thick of skills work at training ahead of an expected move back to midfield. Stephen Hill: A major concern after being sent for surgery on his troublesome left quad, which was causing discomfort while kicking. Returned to pre-season early after five stints on sidelines last year and now might not run for two months. Jesse Hogan: Has progressed to running after a gradual build-up following his season-ending navicular stress fracture at Melbourne. Won't be rushed but Freo will hope Hogan can ramp up skills work after the Christmas break. Griffin Logue: Needed mid-year surgery for a congenital foot problem and now looks in outstanding shape. Ran strongly in the first time trial and impressed as an intercept defender opposed to Brennan Cox during match sim. Aaron Sandilands: Managed only 26 games in three seasons and his second half of 2018 was wiped out by a calf strain. However, the 36-year-old appears in terrific nick, as usual during summer, and went with Rory Lobb in match simulation recently. Michael Walters: The star mid-forward played through knee pain for the majority of last season and is being eased back this summer. Avoided end-of-year surgery and should be back training after Christmas. There's been nowhere to hide with training relocated to Deakin University as GMHBA Stadium gets resurfaced. With Chris Scott taking leave for much of the pre-season to date, assistants James Rahilly and Nigel Lappin have taken up the slack with the line coaches. The Cats have been on the track three days a week: sessions usually start with running before match simulation/specific skills and more conditioning. While skipper Joel Selwood eases back in, there's been no holding back for veterans Gary Ablett, Harry Taylor and Tom Hawkins. Midfield coach Matthew Knights has a lot on his plate after a disappointing 2018 and has already started teaching stoppages, planning for the extra space the introduction of the 6-6-6 starting positions will present. Ryan Abbott: After adding 6kg to his frame during individual weight sessions as many of his teammates travelled the globe, the mature-age ruckman has been battling hamstring tendinitis. Reduced to running laps. Jed Bews: Clocking up plenty of lonely individual kilometres. Removed from any contact work after post-season shoulder surgery and will be eased in during January. Wylie Buzza: Building up his running base after his 2018 campaign was cut short with surgery to repair a Lisfranc injury in his foot. Completing straight line running under the watchful eye of rehab staff before he considers a move into full drills. Jordan Clark: The Cats were always anticipating a delayed start to their first-round draft selection's pre-season as he recovered from tonsillitis and glandular fever. Has been on hand at training, completing light skills. Nakia Cockatoo: Just can't take a trick. Left the track in his second week back complaining of soreness behind his troublesome left knee, before having his tonsils removed a fortnight ago. Hasn't returned to the track since. Jordan Cunico: Underwent a tonsillectomy to remove his tonsils a fortnight ago and hasn't been spotted on the track. Lachie Fogarty: Has barely lifted a finger this pre-season. After groin and calf setbacks in his debut season, has succumbed to adductor tightness. Spent more time on the portable massage table at training than with teammates. Esava Ratugolea: A clean out on his broken ankle post-season has meant a delayed start to his third pre-season campaign. Has started running laps mixed with plenty of stationary ball work. In full-ground drills, often anchored to the goalsquare. Joel Selwood: No injury concern but only completing 60-70 per cent of full training pre-Christmas. Plenty of time post-Christmas to build his running base. Zach Tuohy: A knee complaint suffered in the elimination final loss required post-season surgery. Hasn't been sighted on the track but has started running on the weight-bearing Alter-G treadmill and is expected to return to full running post-Christmas. Everything is new at the Suns. With 13 new players and five new coaches there's been as many introductions as there's been training sessions. Running has been a huge focus with the club employing a part-time running coach, while Stuart Dew has been quick to implement half-ground drills that use every available player. So often dogged by injuries over the years, it's so far so good for the Suns, with the list in good shape to date – touch wood. Sam Day: Had shoulder surgery in the off-season but is already close to a full return. Day is marking the ball and will resume full contact after Christmas. Nic Holman: The tough utility has suffered a bit of back soreness in the past fortnight. It's nothing too serious but his workload will be cut back in the next few weeks before being ramped up again after Christmas. George Horlin-Smith: Like Day, the Geelong recruit had off-season shoulder surgery. He's taken part in the team drills – wearing the orange 'no contact' cap. He'll be fully integrated when the players return from their break. Jack Leslie: The key defender is the biggest concern following an off-season knee operation. He's started back running but is a way off joining the main group. Who takes the Suns forward? The Giants' older players have only been back for a week officially, but many of them have been at the club doing some work by themselves or in small groups for the past month. Veteran Brett Deledio will again be on a specific plan to have him ready for full training in January, but he looks in excellent shape. Aidan Corr: The key defender avoided surgery but is on a modified program after a groin issue ended his season prematurely at round 17. Corr is running and should join the main group in the new year. Toby Greene: The good news is that the star is out of the hard cast and has his ankle in a moon boot after surgery last month. The Giants remain hopeful he'll be running in January. Josh Kelly: Will be on a modified program for the rest of the year because of hip surgery, but Kelly is confident his groin issues are fixed. Has been doing rehab at the club for weeks. Jon Patton: Slowly working his way back from another ACL surgery, and has been at the club working hard in the gym for weeks. Yet to start running. Heath Shaw: The veteran will again do his own individual program until January but has been at the club doing rehab after his knee surgery late in the season. Lachie Whitfield: This year's club champion had minor knee surgery but returned to the club before he was required and has started running, with a view to being back at full intensity before Christmas. The Hawks' pre-season has been spent away from Waverley Park, which is being resurfaced. Instead, they've trained at Xavier College's Kew campus, while a group of young players and recruits also trekked the Kokoda Trail. Coach Alastair Clarkson has overseen things – even taking part in running drills at times – but taken a backseat to his assistants, including returning champion Sam Mitchell. Running and close-range and small-field skills exercises have featured strongly. Grant Birchall: Birchall won't exactly be on a modified program, but won't complete "100 per cent" of the pre-season either, in his own words. His problematic right knee, which wiped out this year and much of 2017, has come good, but a "smarter" program is in place for him. James Frawley: The key defender, who turned 30 in September, has had a gentle lead-in to the pre-season as he deals with what the club says is "soreness". Frawley dealt with a number of different ailments throughout last season, including toe, shoulder, migraine and back setbacks – the latter after landing heavily against St Kilda in round 22 – that cost him a game each. Tom Mitchell: Mitchell underwent minor surgery shortly after his Brownlow Medal triumph to repair his injured right AC joint. But he reported for pre-season duty early, joining the first-to-fourth-year players before they trekked the Kokoda Trail, and hasn't missed a beat to allay fears of a delayed start. Jarryd Roughead: Roughead, who has relinquished the captaincy, missed rounds 21 and 22 after managing a "grumbling" ankle for a period before that and had minor surgery post-season. The plan is for him to step it up on the club's training camp at Mooloolaba next week. Tom Scully: The ex-Giant and Demon fractured the fibula in his right ankle and suffered a syndesmosis injury in round two this year. Cartilage damage, rather than the break itself, extended the initial 12 to 16-week recovery process, but he started "light loading" this week. A number of experienced Melbourne players have been training for several weeks, despite only officially being required at the start of this week. Captain Nathan Jones and All Australian big man Max Gawn have led the way in this area. So far, the Demons have focused on ball movement and defensive drills where there is a distinct 'outnumber'. Alex Neal-Bullen won a recent 2km time trial, while defender Joel Smith has impressed across that distance and in the repeat 300m sprints that form a big part of the running program. Neville Jetta: The defender had shoulder surgery in the off-season. Running laps, but won't join in contact work until after Christmas. Christian Petracca: Went in for a knee operation at the end of the year and as a result is in the rehab group. Running laps, but won't resume contact work until after getting back from the Christmas break. Clayton Oliver: Had surgery on both of his shoulders and, like many others, won't get into work with the main group until after Christmas. Running and moving well in rehab. James Harmes: Another to undergo post-season shoulder surgery. Harmes is running but won't be in contact drills until after Christmas. Jack Viney: Had surgery on his troublesome foot at the end of the season and is on a modified program. Will look to build his training post-Christmas. Oskar Baker: Suffered a recurrence of a hamstring injury in September and the Demons are ensuring he has enough conditioning under his belt before starting him in full training. Tim Smith: Coming back from a stress fracture in his foot. Smith is running laps and will be eased slowly back in to training. Jake Lever: Underwent more surgery on Wednesday after scar tissue around his reconstructed left knee left him in discomfort. Had started running before the setback and is hoping for a mid-year return. Billy Stretch: Running laps at decent speed after having surgery on a stress fracture in his toe in July. Will build his training conservatively. Jake Melksham: Melksham had an arthroscope on his ankle at the end of the season and as a result has been in rehab as he builds up his training load slowly. Marty Hore: The mature-age draftee had an ankle operation before he was picked by the Demons with pick No.56 in the 2018 NAB AFL Draft. He and Melksham have been running laps together. Oscar McDonald: The key defender had a post-season arthroscope on his hip and therefore has been on a modified program. Brad Scott has been a hands-on presence at Arden St since training resumed, keen to fast-track the integration of experienced recruits Jared Polec, Dom Tyson, Jasper Pittard and Aaron Hall. Most of North's veterans were excused from taking part in recent running tests, but Shaun Higgins voluntarily ran the 2km time trial to support his younger teammates. The Roos have had good numbers on the track as they again incorporate much of their fitness work into match-simulation sessions. Scott will take annual leave in January, entrusting his assistants to oversee the pre-season program when the players return from their Christmas break on January 14. The Power will use the next three months to decide on a captain, with vice-captain Ollie Wines and defender Tom Jonas the leading contenders to succeed Travis Boak. But before they make that call, the Power will head to the Sunshine State for a training camp at Noosa from December 12-18. Matthew Broadbent: The experienced defender is progressing nicely from the persistent ankle injury that ruined his season. Broadbent is increasing his running loads, but yet to resume full training. Charlie Dixon: The powerful key forward is back on his feet after surgery in August for a fractured leg. Dixon is back to light training and aiming to play in the JLT Community Series. Willem Drew: Is running strongly in the rehab group as he builds back up after surgery on his right heel in May. The third-year midfielder looks to have bulked up with the aim to play on the inside. Joel Garner: After several shoulder subluxations during his rookie season, the second-year defender had a shoulder reconstruction in June. He's running strongly and just needs to get back into contact work. Robbie Gray: The four-time All Australian had a minor clean-out of his right knee at the end of the season. The champion forward/midfielder is on a modified program in his 13th pre-season given his groin troubles in the past. Sam Gray: The small forward had surgery on his right ankle in late November. Gray carried an ankle issue through the second half of the season. He's expected to be back into full training early in the new year. Hamish Hartlett: Making encouraging progress from a torn ACL in his right knee suffered at training on April 26, running laps and building up his training loads. On track to return to full training in late January or early February. The 10-12 month recovery period puts the experienced defender touch and go for the start of the season. Sam Hayes: Like Hartlett, Hayes is increasing his running loads after a torn ACL at training in June. The Power won't rush the young ruckman's return, but on track for midway through next season. Tom Jonas: The experienced defender has been training with the rehab group, having had minor knee surgery late last season. Jonas should progress to full training early in the new year. Trent McKenzie: Injured his shoulder at training in November and had shoulder labral surgery. Will be reassessed in January. The usual recovery period is three to four months, putting him touch and go for the JLT Series. Tom Rockliff: Had a second reconstruction of his troublesome left shoulder in late August. The former Brisbane skipper has returned to running, but is yet to resume contact work. Might be ready for the JLT Series, but will be close. No enormous changes to the Tigers' pre-season program are expected, although they'll tweak some drills. The veterans can expect an intense introduction to training given there's just three weeks between their pre-season start and mandated Christmas break. They're not scheduled to venture far from Punt Road until their January camp, which has been moved from the Sunshine Coast to the Gold Coast. Josh Caddy: Had an ankle cleanout after the season. Has had no issues and started full training on time. Ryan Garthwaite: Had an ankle cleanout and was on crutches at the club's best and fairest. Is running and working on changing direction but isn't in full training yet. Should pick things up before Christmas. Jack Graham: Had his left shoulder reconstructed in October following his round 16 dislocation. Is running now with low level contact work expected in the New Year and full training by mid-to-late January. Dylan Grimes: Had minor finger surgery after the season. Has had no issues and started full training on time. Tom Lynch: Had his right posterior cruciate ligament repaired in July and had follow-up surgery to remove scar tissue in November. Is expected to run before Christmas and ramp up training in January. Ben Miller: Will start pre-season slowly after a hip cleanout but is expected to be in full training before Christmas. Jack Riewoldt: Had a minor shoulder cleanout at the end of the season. Started pre-season on time but was kept to running drills in the early sessions. Will escalate his involvement before Christmas. Jacob Townsend: Had a plate put over his fibula and his syndesmosis joint wired together in his lower left leg in August. Shed the moonboot and got moving in October. Is on track to do some training before Christmas. A host of senior players returned to pre-season training early, including skipper Jarryn Geary and recruit Dan Hannebery. Endurance beast Dan McKenzie took out the club's 3km time trial in November, beating a personal best time in the process. The club has designed modified training programs for a handful of senior players, including Geary and Jimmy Webster, though they are on track to return to full training after Christmas. Paddy McCartin: The young forward is returning from a Lisfranc injury. He's on a modified program at the moment, but will resume full training at the turn of the new year. Dylan Roberton: The Saints will play it safe with Roberton as he continues his return from a frightening heart scare. He's another on a personally modified program, but is expected to return with the main group soon. Dean Kent: Had shoulder surgery after sustaining the injury with the Demons in round 23. He's being eased back into training and is expected to join the main group after Christmas. Jake Carlisle, Jack Steven, David Armitage: The trio were seen training away from the main group last week, but are simply on a modified program designed for a host of senior players. They are still taking part in most full sessions. Max King: The club's prized No.4 draft pick is still recovering from an ACL injury sustained in April. He is training with the rehab group at the moment, with the Saints set to monitor his progress closely going into 2019. Jack Bytel: The youngster missed most of his draft year with a back injury, which he is still dealing with throughout his first AFL pre-season. He remains in the rehab group, with the club to continue keeping tabs on his progress after Christmas. The Swans' usual training base of Lakeside Oval is under development, so they will use Bat and Ball Oval in Moore Park and Henson Park in Marrickville. Given they played so much footy last season, a host of younger players such as Will Hayward, Ben Ronke and Tom McCartin will be eased into the new season before the Christmas break. Joel Amartey: The athletic rookie is battling an ankle issue, but the Swans are confident it's only minor, and Amartey will be back from his modified program in the new year. Ollie Florent: The speedster pulled up with a sore foot at the end of the season after playing all 23 games this year, but while he's being handled with care, he's back running strongly. Lance Franklin: The superstar had surgery after the groin injury he suffered late in the season didn't heal as fast as the Swans had hoped. Franklin won't hit the track until the new year. Kieren Jack: The veteran had a clean-up operation on his knee post-season and will be on light duties before the Christmas break, before he ramps up his intensity in January. Zak Jones: Another to have knee surgery post-season, the quick midfielder is on a modified program for the rest of the year but should re-join the main group when they return in January. Matthew Ling: Had his debut season ruined by a toe injury which required surgery but is back running, and while the Swans will be careful with the speedster, he should be back in full training in January. Jake Lloyd: This year's club champion will be back on the track full-time in January after hip surgery, but Lloyd is one of the club's most professional players and won't take long to reach peak fitness. Lewis Melican: After his horror run with hamstring injuries this year, the key defender also had knee surgery post-season. He's back running but looks some time away from full training. Callum Mills: The gun youngster is back from his broken foot and while the Swans will take it slowly, Mills is running well and taking part in competitive drills. Colin O'Riordan: Had minor knee surgery in the off-season but the Irishman should re-join the main group early next year. He'll continue on a modified program and increase his running before the Christmas break. Nick Smith: The veteran defender underwent surgery after badly tearing his hamstring against Melbourne in round 21 but should be back into full training early next year. Durak Tucker: The rookie West Australian had a knee reconstruction earlier this year so won't be back into full training until a few weeks before the season proper. Sam Naismith: The big ruckman is working his way back from his ACL surgery. Naismith is running well and is doing plenty of change of direction drills at training, before he's cleared to join the main group early next year. 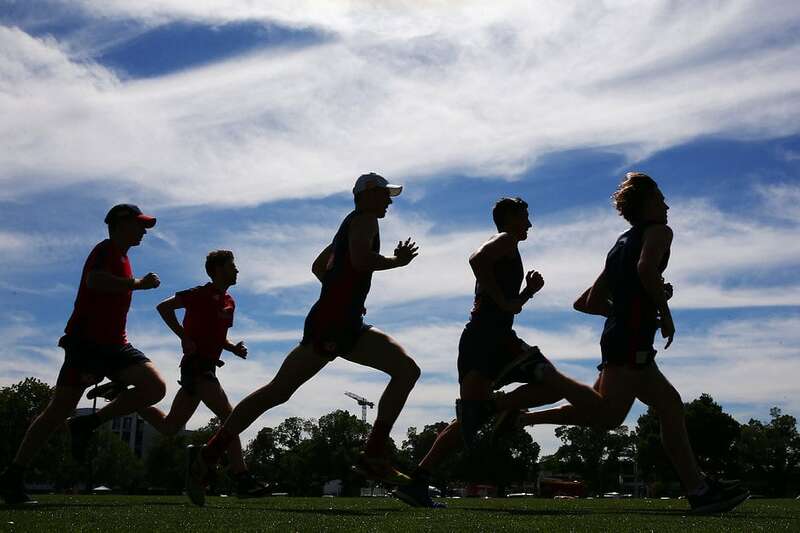 More than 10 players ran personal bests in the 2km time trial on Monday, including star mids Luke Shuey and Andrew Gaff, with rookie recruit Josh Smith taking out the honours. The Eagles' senior core appear to have returned in excellent nick, with Jeremy McGovern in particular looking like he has slimmed down. West Coast will stage a camp in Dunsborough next week before breaking for Christmas. Tom Barrass: Key defender hasn't been in with the main group after finishing the year nursing a foot issue but made a brief appearance at Subiaco Oval on Wednesday. Liam Duggan: Needed a post-season clean-up due to bone bruising and a meniscus tear in the same right knee he had PCL problems with in 2015, and is building his fitness base before returning to main training after Christmas. Josh Kennedy: Had surgery on his left shoulder after the Grand Final and won't do contact work until the new year but has been sighted on the track kicking at goal and in light skills. Chris Masten: Restricted mostly to running so far this pre-season and has been doing a power of work at training. Has a hamstring complaint but doesn't seem a significant problem. Nic Naitanui: Has been out completing rehab exercises on-field and is ahead of where he was last time after his second knee reconstruction. Aiming for a mid-season comeback. Daniel Venables: Underwent a knee scrape and hasn't been seen at all this pre-season. Will build after the Christmas break. Elliot Yeo: Bullocking midfielder needed a toe operation after the Grand Final and is part of the group who are expected to ramp things up in January. Was on the track briefly in sneakers on Wednesday. It's been a stay-the-course approach at Whitten Oval. An unchanged coaching panel, albeit with several assistants re-deployed into different roles, has largely trusted the training processes of recent seasons. Evergreen defender Dale Morris hasn't missed a beat with the 35-year-old setting standards along with fellow veteran Liam Picken. A welcome sight on the track, Picken was back early with the first-to-four-year players despite entering his 10th season and missing the entire 2018 campaign due to concussion issues. Marcus Bontempelli, Josh Dunkley and Mitch Wallis have also been standouts, with the latter and Jackson Trengove becoming part of a six-man leadership group. Bailey Dale: After missing the second half of 2018 following a stress injury to the navicular bone in his foot, Dale has been diligent this off-season focusing on his recovery. He is back running and progressing nicely and could join the main group at training within the next fortnight. Caleb Daniel: The midfielder required post-season surgery to clean up cartilage in his knee. Has resumed running and is expected to progress his training load in the lead-up to the Christmas period. Billy Gowers: The Bulldogs' 2018 leading goalkicker has been limited to running after a car accident that fractured his wrist. He will integrate back into football-based work over the next few weeks. Jason Johannisen: Renowned for his power running from half-back, the 26-year-old had a minor operation to address a hip injury that he managed through the back end of the season. He will gradually build his training loads into next year. Liam Picken: After not playing a game in 2018 through concussion symptoms, Picken continues to have persistent headaches but to a lower level and remains in a non-contact training model. Further testing is a necessity before progressing back into full training. Lukas Webb: The 22-year-old sustained a rare compression injury to a bone in the upper back area of his spine, requiring specialists in his recovery. Although he is back doing low-level running, he is still in a neck brace for the next two months before further scans will determine the next step.